# Do we have milestone evaluation method for progress measurement? Or Have we agreed progress measurement method? # How do I load or allocate the budgeted value? # Do we have milestone evaluation method for progress measurement? Or Have we agreed progress measurement methods? In order to get the appropriate PLAN and ACTUAL % complete, you should have the appropriate milestone evaluation method based on specific and clear milestones to objectively gauge the progress of each activity. As the percentage allocated to each milestone is normally based on the effort estimated to do, your client may not want to overpay when you are achieving less. At the same time, you might not want to claim less when you are done more works. So, it is so important that milestone progress is agreed by your team and client first prior to building S Curve data. For instance – Installation of a pipeline work involves the following milestones and progress allocation. Another example for a production of engineering drawing involves the following milestones and percent allocation. Step 1 - Assign the budgeted value to each activity and its subtasks. Step 2 - Distribute the hour of each subtask over the corresponding schedule period. Step 3 – Aggregate the Planned Value for each period. By following these essential steps, you will get Planned and Earned Value data. For Example: Suppose you have 300 man-hours of piping Installation work is scheduled to be done in five weeks. Allocate that man hour to its subtasks as below. Material receipt (15 hours), Fabrication (75 hours), Erection (60 hours), Bolt up and Weld (60 hours), etc. based on milestone percentage from a table below. Once you done the step 1, you should have the following table as below. For Example: 60 hours of “Erection” work is distributed as (10 hours and 50 hours) over the duration (two schedule periods in this case): Week ending 15th Oct and 22nd Oct as the task covers both periods. See the resource allocation sheet as below. IMPORTANT TIP: Make sure you have an approved or baseline schedule with a well-defined WBS and activities. If a baseline is schedule not ready, then you are not ready to build S Curve for progress measurement. Consolidate the distributed data from the resource allocation sheet to form Planned Value at a given time. How? 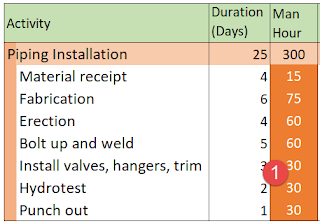 For example: As per snapshot above, Weekly Planned Value: 65 hours at 22nd Oct is obtained by the sum of 15 hours (Fabrication) and 50 hours (Erection) for the same period. What if the project requires you to use weightings instead of man hours as a basis for progress calculation…….? What if the resource, cost or man hour data is not available to you? Meaning, you do not have a resource loaded schedule. In that case, how can you build a realistic progress S Curve? "Determine Planned and Earned Value using the relative value Weighting (fraction) and a milestone evaluation method (system)." You should be able to get the planned value using the same technique as above - Step 1, 2 and 3 if you plan to assign the budged value based on weighting (fraction). #1 Assign the weighting value – 1 to “Piping Installation” because there is no other activity to compare the relative weighting value. #2 Then, distribute its weight value: 1 into its subtasks. For example, assign 0.05 to material receipt – 5%, 0.25 to fabrication – 25%, etc. The total value of the subtasks should be equivalent to 1. #3 Distribute the weighting value of each subtask over the corresponding schedule period. For example: The weighting 0.20 of “Erection” work is distributed as (0.03 and 0.17) over the duration, two schedule periods: Week ending 15th Oct and 22nd Oct as the task covers both periods. See the weighting allocation/progress calculation sheet as below. #4 Consolidate the weightings in each period to form Planned Value at a given time. 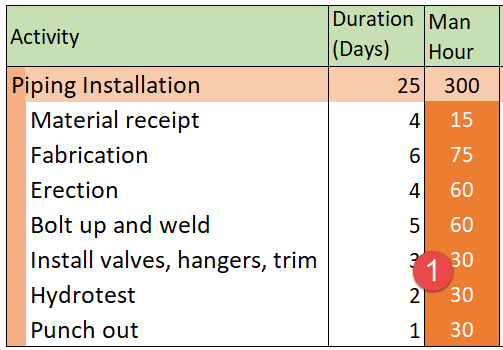 As per snapshot below, for example, Weekly Planned Value: 0.22 at 22nd Oct is obtained by the sum of 0.05 (Fabrication) and 0.17 (Erection) for the same period. How to Calculate Plan and Actual Progress? In the same way, apply the above formula to get the weekly plan percentage for the remaining periods (i.e. week ending 8th Oct, 15th Oct, 29th Oct, 5th and 12th Nov). Once you get Planned % for a period, then you can obtain the Cumulative Planned Progress, for example, 50 % for the week ending 22nd Oct is the sum of the cumulative progress of previous weeks (28%) and current week (22%). Imagine your team received all materials and have achieved 80% of fabrication work as of 15th Oct (week ending 15th Oct). => Firstly, refer to milestone progress table below and physical progress - material receipt 100% completion and fabrication 80% completion, in order to determine Earned Value. => Finally, calculate the Actual Progress. We can conclude from these exercises that Actual Progress ,25 % is achieved against Plan Progress, 28 % at week ending 15th Oct.
How do I get Overall Progress? # What if you have thousands of activities and multidisciplinary works? # How to prepare a progress S Curve in a multidisciplinary project? These questions will be answered in the next POST. For now, try to understand S Curvelogy technique that build the foundation of your S Curve data.